I've been playing with my Accuquilt GO! Baby die again. I got this one at JoAnn Fabrics for about $15. I don't know why they were so cheap a few months ago. I figured they were making room for the new dies??? This die has a pumpkin, acorn, maple leaf (not shown) and oak leaf. The back was provided by my lovely friend, Julianne. Now I must figure out how to quilt it. I'm linking up with Barb at Cat Patches. This is my new FO for the month. Check out what all the other new projects started here. I need to set my fourth quarter goals for the challenges. I have SIX customer quilts to quilt. My goal is to finish all of them between Thanksgiving and the week before Christmas. All I have to do is longarm Circle Lord swirls on them all, but they are all for the most part queen size or larger! I have received Julianne's Easy Street quilt and five others last night. Whew. No pressure here. I know I can do it. I can't believe my Lucky Stars quilt is still on the frame! I thought straight line quilting with locks on the longarm carriage would be quick and easy. It's not hard, but it's very time consuming. I love the effect! It's worth it. In a medium sized bowl, add the graham cracker crumbs and the melted butter and stir. Using a 9X9-inch pan press the graham cracker crust mixture into the bottom of the pan making sure that you have a solid bottom. Bake crust for 5 minutes. Remove pan from oven and allow crust to completely cool before topping it with the rest of the cake. In a separate bowl, blend the cream cheese until creamy. Add the pudding mix, sugar, vanilla extract, and milk. Beat until creamy. The filling should be creamy. If it still appears slightly thick and clumpy, add 1 tablespoon of milk at a time until it is creamy. Pour the cream cheese mixture on top of the graham cracker crust and spread evenly with a rubber spatula or the back of a spoon. Open the can of the pineapple and drain off the excess liquid using a strainer. Press the pineapple to squeeze out more of the liquid. Sprinkle the crushed pineapple on top of the cream cheese. Sprinkle the strawberries and bananas on top of the pineapple. Spread the whipped topping on top of the fruit. Top with a drizzle of chocolate sauce, cherries and nuts for garnish. Place in the refrigerator for, at least, 30 minutes before serving to allow the cream cheese mixture to firm. I have only managed to make one Block Lotto for September so far. Here's "Boomer". It's a 6" x 9" block. I'm happy that I finished this little baby quilt for a friend that is due in October. These are the colors of her nursery. This quilt went together really quickly with the help of my Accuquilt GO! Baby and my 2.5" strip cutter. I am calling it Split Decision #1 because I made more blocks and was not going to add a border. I only need three more blocks and Split Decision #2 will be made. This little quilt measures 45" x 50". Of course it is quilted with Circle Lord Swirls. The back has the cutoff ends that were left from making the blocks. I started cutting out my little trees for the new quilt along at Christa Quilts. LOVE Christa's QA's! Of course I'll be doing my own spin on things. I think I'll make a table topper with the trees. 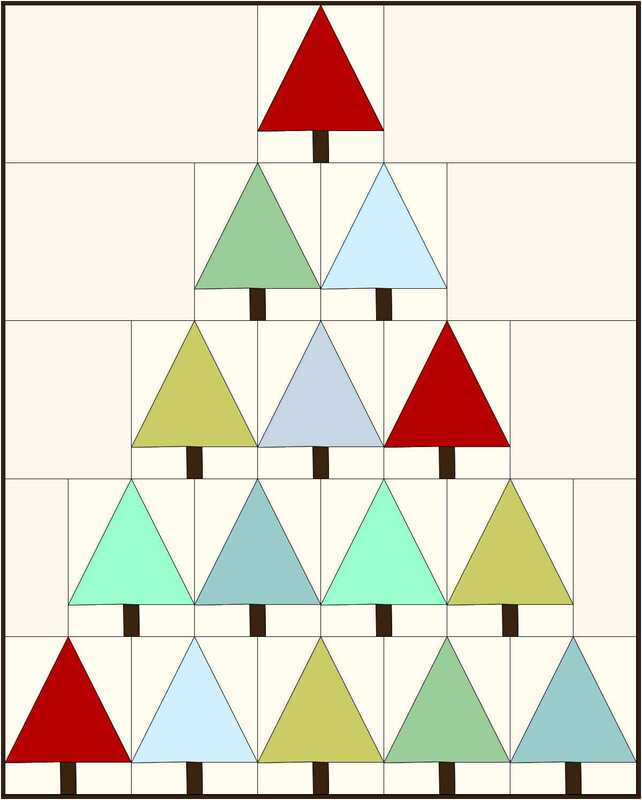 My trees will be smaller, but cut quickly using my Accuquilt GO! Baby. I had all 80 of these perfectly cut beauties cut in about 90 minutes. (I probably could have gone faster had I not been watching tv at the time. This is 55027. The three triangles when put together will make a 3" square. I'll have to figure out how big I want my tree trunks and use my strip cutters for those. I got my solid fabrics from some upholstery/drapery samples that our local quilt shop gave away for FREE last year. I brought home a whole box of these little packs. The QA on Christa's blog doesn't start until 9/25. I just couldn't wait! There's plenty of time for you to join in on the fun. The picture below is from Christa's Blog. This is an option for the QA. This recipe looks like a yummy fall comfort food! I found it on one of my friends pages on facebook. This week it was exciting to finish my Tumbler Charm quilt with 1152 tumblers. I love it! It's mine! It's very sentimental with all these different fabrics I have used in various quilts (plus some). I made a decision to make all the stars the same in my Surround Stars QA top. It's complete. I started a new project, Split Decision baby quilt. Believe it or not, it's quilted and ready for binding! Here's the pieced back that I made for it. I did an improve pieced back for my Split Decision baby quilt. I used all the little cut-off ends to make a strip. I like it! See, the borders really make those blocks stand out. Whohoo. It also looks more crib size now too. Of course my tumbler charm quilt is on my bed! Surround Stars -- Now that's better! I couldn't look at my Surround Stars quilt anymore I had to fix that little block. It just wasn't right. My take on modern wasn't working. Here's the way it is NOW. The little block will end up on the back somewhere. I'm not making this quilt any bigger. It will have green binding. I really like the photo at the top. It makes me happy. Check out the other quilts at the Happy Quilting flickr group. For the Star Surround pattern, go to Melissa's blog Happy Quilting. Speaking of stars, have you seen the contest at Alycia Quilts? Submit five stars and stripes blocks (or choose the blue and yellow log cabin block) for each entry for the prizes. Check it out! I finished the Quilt Doodle Designs BOM for September. I didn't really like this block at first, but when I saw how nice my points turned out, it's one of my favorite blocks in the quilt. This block is called End of Summer. I finished longarming the Pegasus Charity Quilt (a group effort quilt for my local quilt guild). I also picked up a few more quilts at my LQG to longarm for charity. I'm working on the binding on my Tumbler Charm quilt. Expect an exciting Friday Finish! Other than that, not much happening this week. Here are some of the quilts at the county fair that caught my eye. (There's my String of Pearls quilt. It got a 2nd place in the machine sewn category. First place was the first picture on this post.) That quilt had awesome quilting! This one had amazing feather/crosshatch quilting. Someday I want to do that! This week I was giving the Pegasus Quilt and loaded in on the frame. It's called the Pegasus Quilt because each year my LQG makes a quilt to be donated to Pegasus. Pegasus Farms is a therapeutic horseback riding program in our area. My son and I have gone to a few events there. Members of the guild made blue star blocks. The white background fabric was supplied to us and we provided the blue and chose the star pattern. Most of us made two blocks. One block went into this quilt and the other block went into our challenge quilt. The challenge quilt is won by a guild member by drawing a name out of a hat (one chance per block made.) 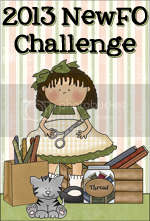 The winner then selects the theme for the next challenge and provides some of the fabric. We do two challenge quilts per year. Anywho... many members contributed star blocks. The person in charge of the challenge put the quilt top together. Another person made the back (it's plain white, but nicely surged and square). I am longarming it. I will pass it off to be trimmed and have the binding put on it. Another person will make a label. Another person will sew on the label. Somebody will present it to Pegasus Farms for their main charity event. It's a whole guild effort. I'm honored that they trusted me to quilt it. I chose to quilt it with Circle Lord swirls since that is what I am most confident with right now. For those of you still reading... You can see my Dodge Ram through the window... AKA my cutting table while my son is in speech therapy. LOL. Didn't realize that was in the shot. Guess it wants credit too. Low and behold and a little insomnia, I was handed this quilt on Tuesday and it is FINISHED (with my part) on Friday!!! I was so nervous about having a white quilt around with a mechanical/construction working husband and a six year old son. I quickly threw it in my truck and delivered it to the next person for trimming and binding. I'm very happy with the longarming!! !